The Gas Turbine Engineering Handbook has been the standard for engineers involved in the design, selection, and operation of gas turbines. This revision includes new case histories, the latest techniques, and new designs to comply with recently passed legislation. By keeping the book up to date with new, emerging topics, Boyce ensures that this book will remain the standard and most widely used book in this field. The new Third Edition of the Gas Turbine Engineering Hand Book updates the book to cover the new generation of Advanced gas Turbines. It examines the benefit and some of the major problems that have been encountered by these new turbines. The book keeps abreast of the environmental changes and the industries answer to these new regulations. A new chapter on case histories has been added to enable the engineer in the field to keep abreast of problems that are being encountered and the solutions that have resulted in solving them. Dr. Boyce has 40 years of experience in the field of Turbomachinery in both industry and academia. His industrial experience includes 20 years as Chairman and CEO of Boyce Engineering International, and five years as a designer of compressors and turbines for various gas turbine manufacturers. His academic experience includes 15 years as Professor of Mechanical Engineering at Texas A&M University and Founder of the Turbomachinery Laboratories and The Turbomachinery Symposium, which is now in its thirtieth year. 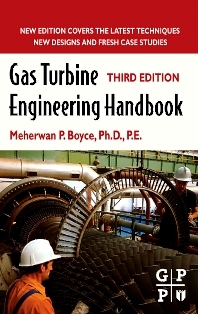 Dr. Boyce is the author of several books and has authored more than 100 technical papers and reports on Gas Turbines, Compressors Pumps, Fluid Mechanics, and Turbomachinery and has taught over 100 short courses around the world, attended by over 3,000 students representing over 400 companies. He is a much-requested speaker at universities and conferences throughout the world.Dr. Boyce received a B.S. and M.S. in Mechanical Engineering from the South Dakota School of Mines and Technology and the State University of New York, respectively, and a Ph.D. (Aerospace & Mechanical Engineering) from the University of Oklahoma.